The Nutritional Value of Mushrooms are Fungi-tastic! Usually the presence of brightly colored fruits and vegetables signals an array of fantastic nutrition. This is true, however, just because a food is light-colored does not mean that it is void of excellent goodness. The lowly mushroom has been one of the most misunderstood, commonly eaten foods. Mushrooms have been used for hundreds of years both as a food and as a medicine. While most mushrooms are edible, some species are not and a few are totally poisonous. For this reason, mushroom hunting in forests is not advised unless you know exactly what you're looking for! Unless you are an expert, please limit your mushroom hunting to the produce section of your grocery store. Mushrooms are usually classified as a vegetable. Some varieties, especially those used for medicinal and health purposes, are referred to as herbs. Mushrooms are actually an edible fungus. The most commonly cultivated and eaten mushrooms are the white button mushroom with the scientific name of Agaricus bisporus. Other popular mushrooms are the oyster mushroom, shiitake mushroom and the portabella. Each different type of mushroom as its own distinct flavor. Mushrooms are used as a meat substitute, especially in vegetarian dishes. Mushrooms are a good source of potassium. Portabella mushrooms contain more potassium than a banana or a glass of orange juice per serving. Mushrooms are also a good source of copper and riboflavin and are a abundant source of selenuim. All edible mushrooms are good sources of selenuim. Selenuim is an antioxidant that works with Vitamin E to protect against free radicals. Selenuim may also be an anti-cancer substance since it has been proven to reduce the risk of prostate cancer. As men age their bodies produce less selenuim, therefore adding mushrooms to their diet increased the selenuim in their blood levels. Mushrooms are interesting in that they are the only plant food that is a source of natural Vitamin D. The nutritional value of mushrooms does not end at this important fact. Mushrooms are also surprisingly rich in other important nutrients. The nutritional value of mushrooms goes far beyond offering important vitamins and minerals. 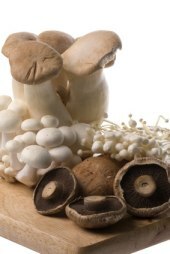 The common white button mushroom may reduce the risk of both breast and prostate cancer. Several varieties of mushrooms are traditionally used in folk and alternative medicine, especially in Eastern medicine practices. Mushrooms have been the source of some pharmaceutical medicines such as penicillin and some anti-cholesterol drugs. Currently, research is focusing on the effects of certain species of mushrooms to boost the immune system and help cure cancer. Certain mushrooms, especially the Shiitake, Reishi and Maitake varieties are classified and used both as food and as healing herbs. The shiitake mushroom contains several substances that are of interest to scientists because of its successful use in various health problems. Shiitake mushrooms have been also used in the treatment and prevention of cancer, heart disease, hypertension and types of infectious diseases. They have also been used in Oriental medicine as a treatment for colds and flu. Research has found that the active part of the shiitake mushroom is a substance which stimulates the immune system, fights infection and may prevent tumors. Reishi mushrooms may be a powerful anti-cancer agent. The Chinese promote reishi to promote a healthy heart and prostate. This mushroom seems to demonstrate anti-tumor properties. Some natural health practitioners use reishi for its sleep promoting effects. Reishi may also bring relief from bronchitis and inhibit allergic reactions. Maitake mushrooms are also medicinal mushrooms. They too, seem to inhibit the growth of tumors and help the immune system to protect against cancer. If you want to the powerful benefits of these exotic fungi, consider taking a mushroom supplement. As with most plant foods, eating mushrooms raw will give you the most nutrition. Canned mushrooms are convent and handy, but the nutritional value of mushrooms, including their anti-cancer properties, are present in the raw varieties. However, it was cooked mushrooms that played a part in the almost miraculous healing of a child, as reported in The New Vision. As with any fresh food product, during the canning and packaging stage, mushrooms lose many of their many nutrients, leaving only the fiber. To get your anti-cancer protection, a natural source of Vitamin D and all of the important antioxidants and minerals found in mushrooms, buy and eat mainly fresh mushrooms. Since there are virtually no calories in mushrooms but lots of nutrition, you may want to start adding this mild and versatile vegetable to your daily diet. Keep raw, white mushrooms handy for a quick and guilt-free nutritional snack.